The blog search engine Technorati suffered from both downtime and slowdown during large periods of December 12 and 13. In those two days, the Technorati website was completely unavailable for a total of more than 9 hours. 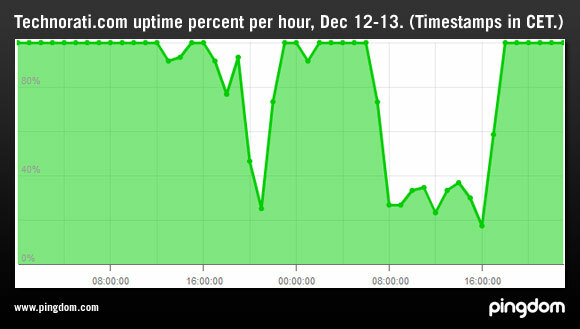 This graph shows the uptime percentage per hour on December 12-13 for the Technorati website. The timestamps are in CET (GMT +1). When the website did respond, it was often much slower than usual. The performance slowdown is clearly visible when looking at its load time, as seen below. 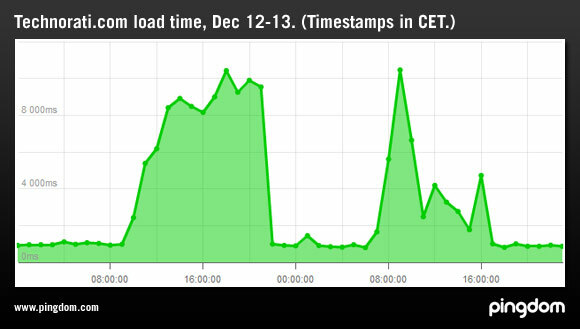 This graph shows the average HTML load time (per hour) on December 12-13 (timestamps are in CET). By HTML load time we mean the time it took to access the web server and download the HTML code for the page. No images or other external elements were being loaded. Technorati’s recent troubles have escaped the attention of the media and the larger blogs so far, but a search for “Technorati down” on Twitter reveals that a lot of people are taking notice. Twitter is usually a pretty good indicator of what is happening on the Web. Is/was Technorati having database trouble? Although there is no mention of any problems on the official Technorati blog (at least as of this writing), it looks like Technorati may have run into database trouble. Alex Lam over at TheBackpackr.com managed to take a screenshot on the 14th of an error page with the following statement: “brb. Ouch! We’ve lost a master database and are restoring from backup. Technorati will be back up soon.” He seems to be located in Malaysia, which means the error message showed up late on the 13th or early on the 14th, European time. If this is really the case, then the problems we detected could very well have been caused by the failed database. We recently wrote about an issue that Technorati had on December 3, but the problem that time was of a different nature. That time someone had mistakenly set the access permissions in a way that made the website refuse access to all visitors. This time the problem was that the website simply didn’t respond at all. If anyone has seen an official statement from Technorati regarding these issues, please let us know in the comments.